Publish the game you made, and let other people play the game! 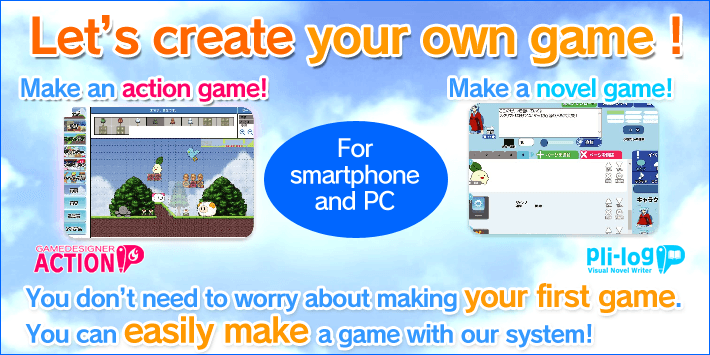 You can easily create even an action game which seems difficult to make, and can play it in smartphone too! Of course you can play it on any PC! Let’s make a game in PLiCy and let everyone play your game on a smartphone! You can put the game on a blog and play it! You don’t need to worry about making your first game. You can easily make a game with our system! Let's make a game now! If you want to create an action game, use Game Designer Action! You can make a game without login! Make an role playing game! If you want to create a role playing game, use Game Designer World!